Of the earlier full-blown death metal acts Mortification from Australia was one of the more interesting outfits. Sounding as a mix between Morbid Angel, Kataklysm and Sinister the lads from down under delivered their ultimate effort with “Scrolls Of the Megilloth”. The band’s second album is a bass-centric slab of thunderous death metal that combined the best of the American and European scenes, on top of being graced with a sense of percussive density and elegant melodicism all its own. Steve Rowe might not have been a particularly gifted vocalist, but he and his fellow band members knew how to write a death metal song. The album was released by Chicago label imprint Intense Records in North America in 1992, while then still death metal-focused German label imprint Nuclear Blast Records promoted and distributed the disc in Europe. The album opens with ‘Nocturnal’ that is initialized with sounds of crickets, frogs and other nocturnal beasties before delving into some dense riffing and simple but effective drumming. The riffs still carry an audible thrash metal vibe, but Rowe’s thundering bass guitar and his semi-shouted, semi-growled grunts push this easily into the realms of death metal. There’s a clear influence from “Blessed Are the Sick” by Morbid Angel in terms of overall construction, and the whole album exudes a sense of urgency and immediacy most closely related to the Kataklysm demo “The Death Gate Cycle Of Reincarnation” and Napalm Death’s stylistically similar “Harmony Corruption”. Rowe’s vocals are cavernous grunts that remain both frightening and surprisingly eligible. Much like Bolt Thrower’s Karl Willets, Dave Ingram from Benediction (and later also Bolt Thrower, for one album alone) and Death mainman Chuck Schuldiner, Steve Rowe pronounces the lyrics surprisingly clearly, especially in the many faster parts. The straightforward drumming is pummeling and intense but never excessive. ‘Eternal Lamentation’ is closest to the title track in terms of construction, and the finale is especially dark and malevolent sounding. It is hard to tell whether the bass guitar is the lead – or support instrument at times, and that is exactly the strength of the record, and the band at this point in time. Mortification was both standard and deceptively smart about what it did, and how it did it. ‘Raise the Chalice’ has some effective double-tracked vocals and funky bass lines, but is rather limp and non-committal otherwise. ‘Lymphosarcoma’ has more double-tracked vocals and is reminiscent of Kataklysm’s slower material. Its first three minutes are stock death metal, but halfway it segues into an introspective, somewhat technical bit between the prominent bass guitar and the rhythm guitar until the drums fall in and the song works towards its conclusion. The title track starts off with chiming funeral bells and a schmaltzy church organ – what it leads to can easily match itself with the better cuts from Kataklysm and Napalm Death of this era. It is by a wide margin the most violent and bloodcurdling cut of the recording. ‘Death Requiem’ owes a good deal to “Hell Awaits” and “Reign In Blood” era Slayer as far as architecture is concerned, and the band doesn’t go out of its way to hide it. The spoken part in the mid section with the chiming bells make it sounds more ambitious and atmospheric than it actually is. This is once again a clever usage of limited resources and studio effects. The concluding spoken part and studio effects strengthen the cut. ‘Necromanticide’ opens with the sampled spooky wind of “The Evil Dead” and an effect of breaking glass. This track is largely similar to the title track in construction, notable is that the guitar playing is far more pronounced here. ‘Inflamed’ is the darkest sounding track of the album along with ‘Eternal Lamentation’. In truth, ‘Inflamed’ is a mere introductory track to the mammoth death/doom epic ‘Ancient Prophecy’, which clocks in at a gargantuan almost 12 minutes. It is the highlight of the album and the ideal closer. The production aims for the thick but clear Morrisound sound of the time. Despite that it wasn’t recorded at that facility the similarity in scope, the replication of tones and overall range is astounding. This could easily be mistaken for a US sound production. To push the record two promotional videos were shot. One being the more accomplished ‘Scrolls Of the Megilloth’ and the other being the largely live shot ‘Terminate Damnation’. Of the two the title track is most representative for the album it is culled from, and ‘Terminate Damnation’ shows the more straightforward and percussive side of the band. As far as early death metal is concerned this album is as haunting as it is atmospheric. Be it through the intelligent usage of sound - and studio effects, eerie melodies or the sparse organ Mortification use everything in moderation. It wouldn’t be a stretch of the imagination if the bass playing on here at least, in part, influenced the writing and playing on Demilich’s sole album “Nespithe”. “Scrolls Of the Megilloth” is an often overlooked sub-classic in the death metal genre – and this in part due to the isolation of their geographic location, as well as the band’s ideological convictions. 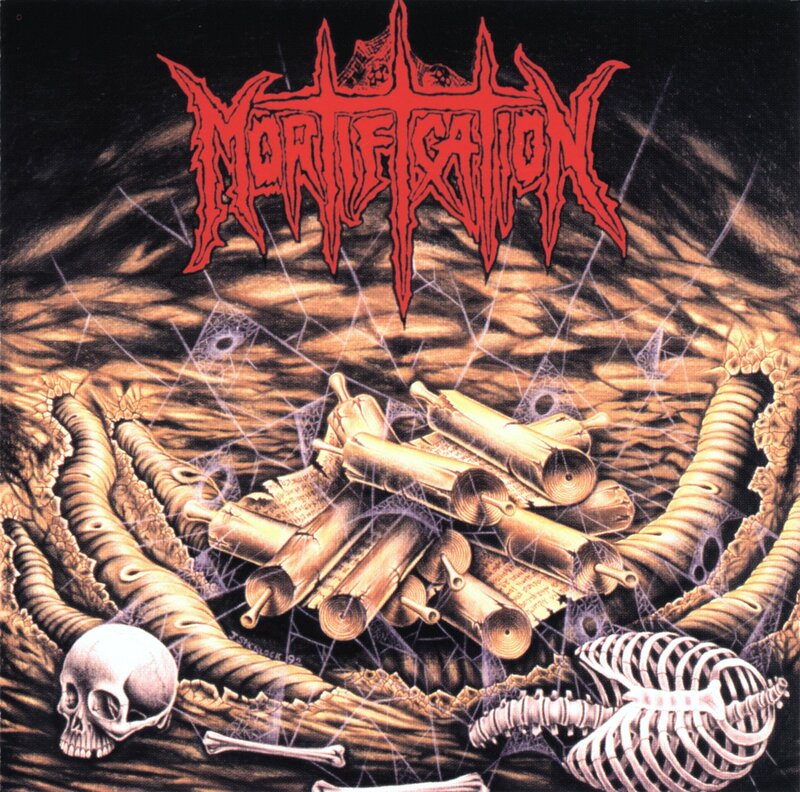 Mortification’s second album could easily measure itself with the American – and European releases of the time. It is largely eclipsed by the band’s extensive catalog of trend-hopping and constant musical reinvention to pander to wider demographics. As far as 90s death metal is concerned “Scrolls Of the Megilloth” is worthy of your undivided attention.